A VISION FOR A BRIDGE: Plans for a crossing between the city of Brooklyn and lower Manhattan dated back to the early 1800s. When the East River crossing was planned, Brooklyn, with about 400,000 residents, was still more rural than urban. The city of New York - which at the time consisted only of Manhattan - had twice as many residents, and the bridge was seen as a solution to overcrowding in Manhattan while spurring development in Brooklyn. The bridge would enable people and goods to cross the East River quickly, regardless of weather conditions. A bridge over the East River, joining the cities of New York and Brooklyn, had been talked about for nearly as long as anyone can remember… But nothing was done. The chief problem was always the East River, which is no river at all technically speaking, but a tidal strait and one of the most turbulent and in that day, especially, one of the busiest stretches of navigable salt water anywhere on earth. "If there is to be a bridge," wrote one man, "it must take one grand flying leap from shore to shore over the masts of the ships. There can be no piers or drawbridge. There must be only one great arch all the way across. Surely this must be a wonderful bridge." In 1855, John Roebling, the owner of a wire-rope company and a famous bridge designer, proposed a suspension bridge over the East River after becoming impatient with the Atlantic Avenue-Fulton Street Ferry. Roebling worked out every detail of the bridge, from its massive granite towers to its four steel cables. He thought his design entitled the bridge "to be ranked as a national monument… a great work of art." The elder Roebling had experience with suspension spans, with bridges along the Delaware, Niagara and Ohio Rivers. The first of these, the Delaware Aqueduct (1848) between Lackawwaxen, Pennsylvania and Minisink Ford, New York, is the oldest surviving suspension bridge in America. The second, the Niagara Suspension Bridge (1855), served rail and carriage traffic until it was replaced with a stronger steel-arch bridge in 1891. The third, the Cincinnati-Covington Bridge (1867), was significantly strengthened in the 1890's with the addition of a steel deck truss, and remains in service today. Initially, Roebling was met with cool reception by the city governments of New York and Brooklyn. He then approached William C. Kingsley, a Brooklyn businessman with political connections and publisher of the influential Brooklyn Eagle, who met the idea with enthusiasm. In turn, Kingsley enlisted the support of Henry Murphy, a state senator and former mayor of Brooklyn. Murphy then drafted a bill to the New York State Legislature that would enable a private company to build a bridge connecting Manhattan and Brooklyn. In 1867, a group of prominent leaders formed the New York Bridge Company "for the purpose of constructing and maintaining a bridge across the East River." Under the enabling act, the city of Brooklyn (which stood to benefit the most from the bridge) subscribed for $3 million of the capital stock, while the city of New York only subscribed for $1.5 million. The company was permitted to fix toll rates for pedestrians and all types of vehicles, receiving a profit of no more than 15 percent per year. Responding to those who doubted the need for the bridge, Roebling responded that projected growth in the cities of New York and Brooklyn would necessitate the construction of additional bridges. Specifically, Roebling suggested future construction of the Williamsburg and Queensboro bridges further north along the East River. Two years later, in June 1869, the New York City Council and the Army Corps of Engineers approved Roebling's design. Later that month, while examining locations for a Brooklyn tower site, Roebling's foot was crushed on a pier by an incoming ferry. Roebling later died of tetanus as a result of the injuries. Immediately following Roebling's death, his son, Washington, took over as chief engineer of the Brooklyn Bridge. DEEP AND DARK UNDER THE EAST RIVER: Soon after ground was broken on January 3, 1870, work on the Manhattan and Brooklyn foundations. The 3,000-ton pneumatic caissons - large, airtight cylinders in which workers cleared away layers of silt in an atmosphere of compressed air underneath the riverbed - were dug 78½ feet below the river on the Manhattan side, and 44½ feet below the river on the Brooklyn side. To expedite the descent of the caissons, dynamite was used for the first time in bridge construction. The foundations took three years to construct. Inside the caisson everything wore an unreal, weird appearance. There was a confused sensation in the head, like "the rush of many waters." The pulse was at first accelerated, then sometimes fell below the normal rate. The voice sounded faint unnatural, and it became a great effort to speak. What with the flaming lights, the deep shadows, the confusing noise of hammers, drills and chains, the half-naked forms flitting about, if of a poetic temperament, get a realizing sense of Dante's inferno. One thing to me was noticeable - time passed quickly in the caisson. Fires, explosions and caisson disease (caused by changes in air pressure that affect nitrogen levels in the bloodstream) took the lives of 20 men, and left Washington Roebling himself paralyzed. Thereafter, the younger Roebling, with the extraordinary assistance of his wife Emily, directed the construction of the bridge from his Brooklyn residence. With her husband's assistance, Emily Roebling studied higher mathematics and bridge engineering, and soon made daily visits to the bridge to oversee her husband's staff of engineers and builders. THE TOWERS OF THE BRIDGE RISE: Between 1873 and 1877, work continued on the anchorages, towers and cables under the direction of Washington Roebling. The 276-foot neo-Gothic granite towers, which feature two arched portals, were built to withstand strong winds and provide support for rail lines. The towers would dwarf everything in view… On the New York skyline only the slim spire of Trinity Church at the head of Wall Street reached higher. The towers were to serve two very fundamental purposes. They would bear the weight of four enormous cables, and they would hold both the cables and the roadway of the bridge high enough so they would not interfere with traffic on the river. Were the two cities at higher elevations, were they set on cliffs, or palisades such as those along the New Jersey side of the Hudson, for example, such lofty steelwork would not be necessary. As it was, however, only very tall towers could make up for what nature had failed to provide, if there was to be the desired clearance for sailing ships. And as the mass of the anchorages had to be sufficient to offset the pull of the cables, where they were secured on land, so the mass of the towers, whatever their height, had to be sufficient to withstand the colossal downward pressure of the cables as they passed over the tops of the towers. CONNECTED BY WEBS OF WIRE AND STEEL: In August 1876, the two anchorages were linked across the East River for the first time by a wire rope. To commemorate this occasion, and to demonstrate the integrity of the wire rope, master mechanic Farrington crossed the East River riding on a boatswain's chair tied to the rope. The suspended roadway's great "river span" was to be held between the towers by the four immense cables, two outer ones and two near the middle of the bridge floor. These cables would be as much as fifteen inches in diameter, and each would hang over the river in what is known as a catenary curve, that perfect natural form taken by any rope or cable suspended from two points, which in this case were the summits of the two stone towers. At the bottom of the curve each cable would join with the river span, at the center of the span. But along all the cables, vertical "suspenders," wire ropes about as thick as a pick handle, would be strung like harp strings down to the bridge floor. And across those would run a pattern of diagonal stays, hundreds of heavy wire ropes that would radiate down from the towers and secure at various points along the bridge floor, both in the direction of the land and toward the center of the river span. The wire rope for the suspenders and stays was to be of the kind manufactured by Roebling at his Trenton (wire) works. It was to be made in the same way as ordinary hemp wire rope, that is, with hundreds of fine wires twisted to form a rope. The cables, however, would be made of wire about as thick as a lead pencil, with thousands of wires to a cable, all "laid up" straight, parallel to one another, and then wrapped with an outer skin of soft wire, the way the base strings of a piano are wrapped. Deviating from tradition, Roebling introduced the use of steel, which he called "the metal of the future," for the four cables. At the time, steel was being used for construction of the railroads, but its use had not yet been used for major structures such as bridges. 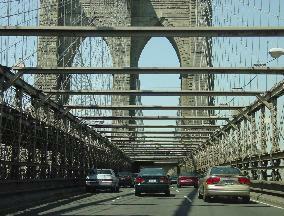 Until the Brooklyn Bridge was constructed, iron wire was used for suspension cables. Roebling defended his use of steel wire in an article in The American Railroad Journal, discussing the weaknesses of earlier iron-wire and chain suspension bridges and their vulnerability to destructive oscillation caused by high winds. In February 1877, not long after the temporary footbridge was finished, work began on spinning the four cables at the Manhattan and Brooklyn anchorages. The four steel cables, which could each hold 11,200 tons, connect the anchorages with the Manhattan and Brooklyn towers, where the cables pass over saddles within the towers. Each main cable, which has a diameter of 15¾ inches, is comprised of 19 strands containing a total of 5,434 steel wires. Once the spinning of the four main cables was completed in October 1878, workmen strung wire ropes from the cables down to the bridge floor. More than 14,400 miles of wire were used for the suspender ropes. After the suspending ropes and deck beams were in place, the diagonal stays were installed. CREATING THE "GREAT AVENUE" ACROSS THE EAST RIVER: From one end to the other, the Brooklyn Bridge measures 6,016 feet, including approaches. The long river span passes the tower arches at an elevation of 119 feet, gradually rising to 135 feet above the East River at mid-span to accommodate passage of even the tallest ships. (The 135-foot clearance soon became the standard for bridge construction.) Because of the elevation of the span above the East River and the relatively low-lying shores, the rest of the bridge, sloping down to ground level, had to extend quite far inland on both sides of the river to provide an easy three and one-quarter percent grade. Roebling designed the Brooklyn Bridge to have a load capacity of 18,700 tons. He planned to run two elevated railroad tracks, which were to connect to elevated railroad systems in New York and Brooklyn, down the center of the bridge. On either side of the tracks, he designed four lanes - two lanes on two outer roadways - for use by carriages and horseback riders. Directly over the tracks, he provided an elevated promenade for pedestrians and bicyclists. To support the load, and to protect the span from high winds and vibrations, deep stiffening trusses were constructed. Indeed, construction was delayed because Roebling had to redesign the trusses for the heavier trains of the day. Construction of the bridge understructure, the stiffening trusses, and the roadway began in March 1879, and continued for four more years. The 1,595-foot main span would be the longest for any suspension bridge in the world, and would be more than 500 feet longer than John Roebling's Cincinnati-Covington Bridge. THE FINISHING TOUCHES: At the beginning of 1883, with the Brooklyn Bridge nearing completion, two final details had to be worked out before it opened. First, two terminal buildings, complete with ornate ironwork and plate-glass windows, were to be constructed at the Manhattan and Brooklyn ends of the bridge. Second, seventy blue-white, electric arc lamps were to be installed along the promenade at intervals of about one hundred feet. Roebling gave these last details his full attention. The bridge is a marvel of beauty viewed from the level of the river. In looking at its vast stretch, not only over the river between the towers, but also over the inhabited, busy city shore, it appears to have a character of its own far above the drudgeries of the lower business levels. THE BROOKLYN BRIDGE OPENS: The Brooklyn Bridge cost $15.1 million to build, $3.8 million of which was to purchase land for approaches and the remainder going toward construction. This was more than twice the original cost estimate of $7 million. On May 23, 1883, President Chester Arthur and Governor Grover Cleveland officially dedicated the Brooklyn Bridge before more than 14,000 invitees. Emily Roebling was given the first ride over the completed bridge with a rooster, a symbol of victory, in her lap. After the opening ceremony, anyone with a penny for the toll could cross the Brooklyn Bridge. On the first day, the bridge carried trolley lines, horse-drawn vehicles, and even livestock. As the sun went down the scene from the bridge was beautiful. It had been a perfect day. Up and down on either side of New York the bright blue water lay gently rippling, while to the south it merged into the great bay and disappeared toward the sea. The vast cities spread away on both sides. Beyond rolled the hilly country until it was lost in the mists of the sky. All up and down the harbor, the shipping, piers and buildings were still gaily decorated. On the housetops of both Brooklyn and New York were multitudes of people. The great buildings in New York loomed up black as ink against the brilliant background of the sky. The New York bridge pier looked somber and gloomy as night. But in Brooklyn, the blaze of the dying sun bathed everything gold. The great building looked like burnished brass… In the west, the sun sent its last tribute to the bridge in a series of great bars of golden light that shot up fan-like into the blue sky. Gradually the gold melted away, leaving the heavens cloudless. The sky was a light blue in the west, but grew darker as it rose, until it sank behind Brooklyn in a deep-sea blue. Slowly the extremities of the twin cities began to grow indistinct. The towers of Brooklyn lost their golden hue. They seemed to sink slowly into the city itself. In New York, the outlines of the huge buildings became wavering and indistinct. Then one by one, the series of electric lights on the bridge leaped up until the chain was made from Brooklyn to New York. Dot by dot, flashes of electric light sprang up in the upper part of New York. The two great burners at Madison and Union Squares flared up, and the dome of the Post Office in New York set a circlet of diamonds out against the relief of the sky. The streets of the two cities sparkled into life like the jets on a limitless theatrical chandelier, and the windows of the houses popped into notice hundreds at a time. Long strings of lanterns were run over the rigging of the shipping in the harbor, and red and green port and starboard lights seemed numberless. The steamers sped on the water, leaving long ripples of white foam, which glistened in the light like silver. However, amid the novelty, there was tragedy. On Memorial Day, 1883, a woman who was walking up the steps of the Manhattan side tripped, and her female companion screamed. The scream triggered off a rumor that the bridge was about to collapse. In the panic and resulting crush, 12 people were killed and 35 others were seriously injured. CHANGING WITH MORE THAN A CENTURY OF PROGRESS: Certainly, the Brooklyn Bridge lived up to, and exceeded its great expectations. Ten years after the bridge opened, the city of Brooklyn annexed adjoining towns until it encompassed all of Kings County. In 1898, fifteen years after the bridge opened, the bridge helped unite Manhattan with Brooklyn, Queens, the Bronx and Staten Island to form Greater New York. That year, the roadway was configured to allow trolleys and automobiles to travel in the outer lanes. By 1910, the penny toll on the Brooklyn Bridge was removed after the City of New York passed a law prohibiting the use of tolls to finance construction and maintenance of its bridges. When the elevated Brooklyn Rapid Transit (BRT) lines stopped running in 1944, the trolleys moved from the shared lanes to the protected elevated tracks. A decade later, when the trolleys stopped running, the elevated tracks were removed, and the roadways were rebuilt. On May 24, 1983, the 100-year anniversary of the opening of the Brooklyn Bridge was marked by parades, a flotilla of tall ships, and a massive Grucci fireworks show. President Ronald Reagan led a procession of vehicles across the bridge, repeating the route that President Chester Arthur had taken 100 years earlier. THE BROOKLYN BRIDGE TODAY: The Brooklyn Bridge was designated a National Historic Landmark by the federal government and a National Historic Civil Engineering Landmark by the American Society of Civil Engineers. In recent decades, the landmark structure has been refurbished to handle the traffic demands during its second century. The bridge, which now accommodates six lanes of automobile traffic, carries approximately 145,000 vehicles per day (AADT). After nearly 120 years, the bridge still has the 44th longest main span among the world's suspension bridges. CURRENT AND FUTURE IMPROVEMENTS: In February 1999, the New York City Department of Transportation (NYCDOT) ordered an emergency re-decking project on the Brooklyn Bridge after bridge inspectors found concrete chipping away from the steel girding. The deck is made of steel meshing, which is filled with concrete to make it stronger. Part of the concrete has been disintegrating, causing the bridge deck to weaken. The six-month-long, $33.5 million re-decking project, the first since 1954, was completed in October 1999. Also in 1999, the NYCDOT rehabilitated the Manhattan bridge approach over Franklin Square, at the intersection of Pearl and Cherry streets. Engineers retrofitted the existing trapezoidal trusses with six steel arches founded into the original masonry abutments. The steel arches, which vary in length from 147 feet to 190 feet (to fit within the original truss framework), were used as permanent falsework to support the original trapezoidal trusses. The end result was a structure that not only preserved the aesthetic quality, but also enhanced the structural viability of the original span. In 2001, work began on the first stage of Brooklyn Bridge Park in Brooklyn. The first stage, which includes conversion of an underutilized parking lot into green space, construction of a gravel walkway around the green space, and building a nautical-themed playground, is slated for completion in 2002. When all construction stages are completed, the Brooklyn Bridge Park will be a 1.3-mile-long, 70-acre public space along the East River. The $550 million park, which is being financed from public and private sources, will include an indoor recreation facility, restaurants and a hotel. The NYCDOT plans to completely rebuild all of the elevated approaches to the bridge, which city inspectors rated "structurally deficient" under the Federal Highway Administration's (FHWA) rating system. Inspectors found crumbling concrete and rusting joints on the approaches, but a NYCDOT official said the problems mostly affect the driving surface and not the superstructure. The $725 million ramp rebuilding project currently is scheduled for completion in 2011, but may be fast-tracked in wake of the 2007 collapse of the I-35W Mississippi River Bridge, another span deemed "structurally deficient." In a separate project, the NYCDOT plans to build a new direct ramp to connect the westbound lanes of the bridge to the southbound FDR Drive. (Currently, motorists must travel through local streets to reach the southbound FDR Drive, contributing to chronic congestion.) The new $200 million ramp, which would be built alongside the existing ramp to the northbound FDR Drive, was postponed indefinitely due to budget cuts. HOV RESTRICTIONS POST-9/11: For several weeks after the September 11, 2001 terrorist attack on the World Trade Center, the Brooklyn Bridge was closed to all traffic except emergency vehicles. When the bridge reopened, the New York City Department of Transportation (NYCDOT) imposed new HOV restrictions as part of larger-scale efforts to reduce congestion in Manhattan below 63rd Street. The Manhattan-bound HOV restriction applied during the morning rush until November 2003. THE BROOKLYN BRIDGE WON'T BE SOLD ANYTIME SOON: In 2002, Mayor Michael Bloomberg sought to either transfer ownership or sell the Brooklyn Bridge to MTA Bridges and Tunnels. According to one estimate, the Brooklyn Bridge and the other toll-free East River Bridge under NYCDOT would bring in approximately $800 million in annual toll revenue. The tolls would most likely be collected electronically since there is limited space to construct new toll plazas, and congestion (peak-hour) tolls likely would be implemented. The transfer or sale would have required the approval of the City Council and the State Legislature, but Governor George Pataki killed this plan. Nevertheless, Bloomberg continued his push for tolls on the bridge with his planned congestion-pricing program for Manhattan. 1884: P.T. Barnum demonstrated the safety of the bridge by parading across it with a herd of 21 elephants. 1895: Clara McArthur was the first woman to jump off the bridge, weighting her stockings with 20 pounds of sand so that she would fall feet first. She survived the fall. 1933: According to a letter published in the Brooklyn Eagle, a woman claimed that she climbed up the walkway to the Brooklyn tower, and jumped rope on top of the tower. 1960: Ed Quigley wagered $100 with his drinking buddies that he would survive a jump off the Brooklyn Bridge. He won the bet. 1974: Jimmy Weber, a young restaurant worker, decided to imitate Spiderman and scamper up and down the cables 120 feet above the roadbed. Police followed him on a wild chase. 1974: Mario Manzini, dressed like Elvis Presley, tried to jump off the bridge in handcuffs to prove that he was the best escape artist since Houdini. Police thwarted this escape attempt. 1977: Dan Cameron Rodill, a former war correspondent and aspiring playwright, climbed up the Manhattan tower to draw attention to his unemployment. When the police tried to talk him down from the tower, Rodill handed them a press release. 2001: On undoubtedly the saddest day in the history of the bridge (and of New York City), thousands of people fled by foot across the bridge to escape the destruction at the World Trade Center. 2006: City workers conducting a regular bridge inspection found a cold-war era supply chamber inside the foundation near the Manhattan shoreline. More than 350,000 items, including half-century-old water drums, food canisters, and medical supplies were found inside the chamber. The supplies were to have been used in the event of a nuclear attack on New York City. SOURCES: "Concise Description of the East River Bridge" by E.F. Farrington, C.D. Wynkoop Printers (1881); The Great Bridge by David McCullough, Simon and Schuster (1972); The Bridges of New York by Sharon Reier, Quadrant Press (1977); "The Lore, Legends and Legacy of the Brooklyn Bridge" by Patrice O'Shaughnessy, New York Daily News Magazine (5/22/1983); Great American Bridges and Dams by Donald C. Jackson, Preservation Press-John Wiley and Sons (1988); Engineers of Dreams by Henry Petroski, Vintage Books-Random House (1995); "Brooklyn Bridge Digital Library," Long Island University (1995); "A Guide to Civil Engineering Projects in and Around New York City," American Society of Civil Engineers (1997); Bridges by Judith Dupre, Black Dog And Leventhal Publishers (1997); "Gateway to a Century: The Magnificent Brooklyn Bridge Becomes the Last Great Work of an Age" by Drew Fetherston, Newsday (3/15/1998); "Brooklyn Bridge Fix-Up" by James Rutenberg, New York Daily News (2/04/1999); The Creation of Bridges by David Bennett, Chartwell Books (1999); "Franklin Square Bridge," Modern Steel Construction (July 2000); "First Phase of Brooklyn Bridge Park Underway," New York Construction News (November 2001); "Plan To Cut Construction Spending Would Delay Willis Avenue and Brooklyn Bridge Projects" by Michael Cooper, The New York Times (2/21/2002); "Mayor Weighs Plan To Turn Over Bridges to Transit Authority" by Jennifer Steinhauer, The New York Times (10/22/2002); "Inside the Brooklyn Bridge, a Whiff of the Cold War" by Sewell Chan, The New York Times (3/21/2006); "Brooklyn Bridge Rated Worse Than Doomed Span" by Benjamin Lesser, Pete Donohue, and Greg B. Smith, New York Daily News (8/03/2007); "Century-Old Brooklyn Bridge Not at Risk," The New York Times (8/04/2007); New York City Department of Transportation; New York Metropolitan Transportation Council; Hank Eisenstein; Dave Frieder; Ralph Herman; Len Pundt; Christof Spieler. HOV sign by C.C. Slater. Back to The Crossings of Metro New York home page.